Sunnydaze Children Playing with Water Faucet Outdoor Garden Fountain with LED Lights, 40 Inch | Fountain City Art Ctr. 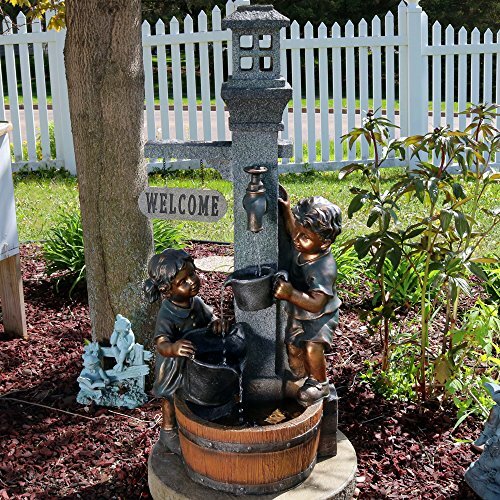 Add whimsy and charm to your patio or yard with this elegant fountain featuring playful children gathering around the water faucet to fill up their buckets after an afternoon full of sun. This outdoor garden fountain is sure to add a lighthearted, carefree feel to your outdoor space as you listen to the peaceful cascade of water falling from the faucet spout and into the children's buckets. There are two LED lights; one is electric and located in the bottom "basin" reflecting in the water and lighting up the decor piece at night. The other is a solar light located in the top gray "window" of the fountain, charged by the solar panel located at the top of the fountain. The solar panel charges during the day via sunlight and the on/off switch located near the solar panel allows you to turn the light on and off easily. No plumbing is required. Once you have the fountain in-place and filled, all you have to do is plug it into a standard outdoor electrical outlet. Overall dimensions: 15 inches wide x 15 inches deep x 40 inches tall, weighs 27.5 pounds. Top bucket and middle bucket are 2 inches deep, bottom basin is 3 inches deep. Fountain is made from a polyresin material that is easy to maintain. The children statues are painted with a metallic brass colored paint, adding to the realistic sense of the fountain. Fountain includes two LED lights, one is electric and located in the bottom basin and one is solar and located in the top window. Fountain also includes a submersible electric WP350LV pump with 1/2 inch hose diameter. Fountain contains a rechargeable battery that can operate 6-8 hours when fully charged via the solar panel and full sunlight. On/off switch located near the solar panel allows you to turn the lights on and off.